Link you SAP data to your Intrexx portal and model entire business processes from SAP - possible even across multiple SAP systems. In this way, you can implement completely new approaches, such as an extranet where partners can view price lists and customers can retrieve the status of their order. The Connector takes advantage of the Remote Function Call (RFC): Via the browser, a request is sent to the Intrexx server via http/https. 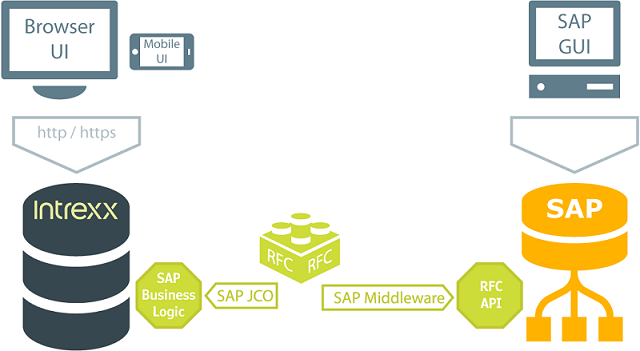 The Intrexx server calls the corresponding RFC module using the SAP middleware provided by SAP. The SAP middleware retrieves the requested data in the appropriate SAP system via RFC-API and returns this to the Intrexx server as a response. The Connector is complete integrated into the Intrexx application framework. There are two options available for the Connector for SAP Business Suite. With this module, you can model writing scenarios and functional calls. Examples for such scenarios include availability checks and price requests. All operations performed on the data (read, change, write) are exclusively carried out in the SAP system. Accessing the data from the Generic Store can take place via an ALV Grid with which the data can also be exported to MS Office products (e.g. newsletter). The Developer API options contains a complex framework for developing bi-directional scenarios as is often the case in projects. Here, data structures and processing logics are already available in SAP. The required portal functions (e.g. read, write, delete) are available in SAP in an object-oriented ABAP framework.